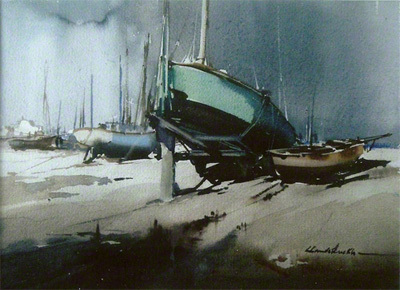 In this delightful signed sketch the water colour technique of Claude Buckle is amply demonstrated with this subject matter of boats on a beach and an interesting sky. The water appears to be absent but is in fact in the foreground. Note how the darkening sand perfectly balances and emphasizes the lighter parts of pictures and is in balance with the dark sky. Courtesy Somerset Fine Art. Created in .